Michael Torlen: "The Evidence of What Remains"
When we consider Michael Torlen's new work, an observation art historian John Wilmerding made about the evolution of marine art comes to mind. "Because marine painting was less bound to precedent than other genres for subject or manners of painting," Wilmerding noted, "it often permitted experimental and fresh expressions. "1 Drawing on personal experience, family history, literature and life, Torlen refreshes the marine genre, as he tips his brush to past generations-of artists and fishermen. Part of the power of Torlen's vision derives from first-hand knowledge of his subject. Earlier in his life he worked alongside his Norwegian-born father, a commercial fisherman, on a tuna clipper off the coast of Southern California. 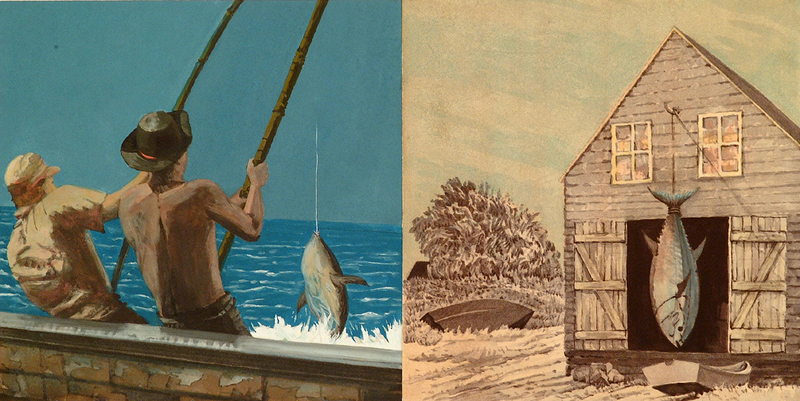 From visits to Maine over the past quarter century the artist also knows the island fishermen, on Monhegan and elsewhere, hardy individuals who brave deep waters to gain a living. These connections lend resonance-and the ring of truth-to this work. Torlen's work also responds to the loss of fisheries and a way of life, at times in a forthright manner. The cross-out sign superimposed on the suspended tuna in Warning speaks directly to an imminent collapse. A figure in a yellow hat points to the bluefin as if to say, "Look, the fish are disappearing." The theme of survival runs through this work. In For Hemingway, inspired by The Old Man and the Sea, Torlen evokes the epic struggle of Santiago, the old Cuban fisherman, in a simplified, powerful manner. A figure in the foreground appears to bow to a gray shark. Is it out of respect for the adversary that tore apart Santiago's marlin as he brought it to shore, lashed to his skiff? The shoulders seem to express other emotions, of loss and resignation, as well as the weight of the world. The technical means match the vision throughout the exhibition. 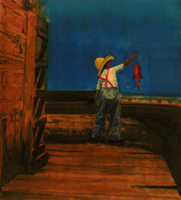 In the monotypes, Torlen experiments with various mediums to re-energize the seascape tradition. Pigmented digital printing, plate lithography and silkscreen contribute to the visual dynamics. In Red Dory two men in a boat are immersed in a caul of luminous color. Another monotype, Hook, uses a feathered barb as a repeating graphic element. Other pieces, like Fish Corner, Fish and Yellow Sea and Anticipation, have a marvelous surreal quality. In the end, Torlen invites his viewers to explore layers of memory and mediums, and to join him in creating a narrative out of the "seamarks" of life and art. Carl Little's books include "The Watercolors of John Singer Sargent" and "Edward Hopper's New England." His reviews appear regularly in Art in America and Art New England. He lives and writes on Mount Desert Island. 1. John Wilmerding. American Marine Painting. New York: Henry Abrams, Inc., 1987, p. 7. 2. "Those who fished for halibut were, according to contemporary reports, 'chosen men.. There is no branch of the fisheries which demands of the men employed in it more skill, endurance, and courage..'" Nicolai Cikovsky, Jr., and Franklin Kelly. Winslow Homer. New Haven: Yale University Press, 1996, p. 228. 3. With his brilliant Monhegan seascapes, Torlen takes his place in the distinguished line of painters who have rendered the island's shoreline, from Aaron Draper Shattuck, in the mid-1800s, to such contemporaries as Susan Shatter. 4. Norwegian for "Songs for My Mother." An earlier series was dedicated to the artist's father. 5. Artist statement, July 2005.